Looks as though the reconstruction of this section of the Albany Fred Meyer store’s parking lot got finished just in time to test how well the new bio-swales are working in a rainstorm. It also looks as though the builders might have made the inflow opening just a hair lower. 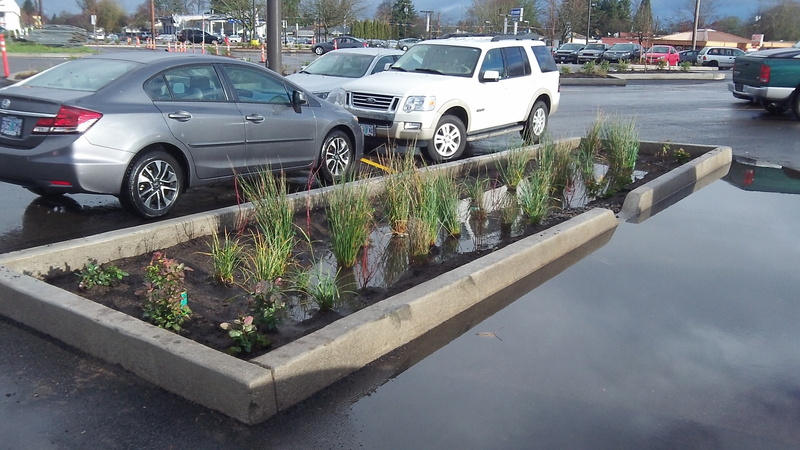 Features like this are an integral part of modern parking lot design. The idea is to let rain water from paved surfaces soak into the ground, along with any contaminants the runoff carries. That’s supposed to keep pollution out of our streams, a worthy goal in itself. 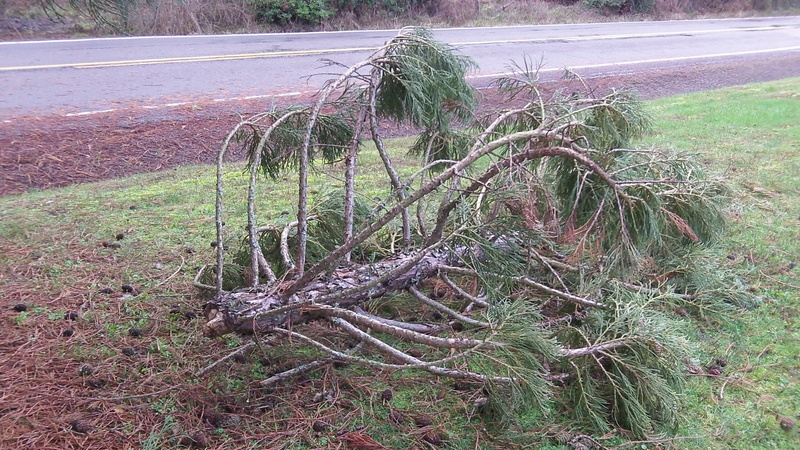 This little scene was one I noticed after the mid-valley’s deluge and windstorm Monday morning. Another part of the result I didn’t see till I got home again. If that’s the particular bio-swale I’m thinking it is, there’s a sewer drain on the far side – where there’s no standing water. The bio-swale appears to have created a huge puddle in front. Which may explain why that parking space is empty. Who would want to park a car there and get their feet wet upon disembarkment? Imagine going into the store, returning after a rain, only to find your car in the middle of that puddle! And that’s called “working”? I’ll have to look at them next time I’m at Freddy’s. The science of swales is easy to understand and seem like they provide good benefit for minimal cost — replenishing the ground water, allowing the dirt and sands and clay to filter the water, lessening the amount that needs to enter the storm drains. It looks like that particular swale could be made more efficient if the contractor chose to come back and make it so. If nothing else, they could learn from it and make future ones more efficient. Still, this is an improvement and was done as part of larger project. I’d like to see this become common practice when sidewalks and streets are replaced. Swales work fine. They mostly assist people nearbye still using wells. Excess water should go to a deep lake and then sold for a faction of clean water cost as ‘grey water’. great for flushing toilets and washing cars and watering lawns. Tree City USA with dying trees and yellow dead appearing lawns in the heart of Grass Seed Production. Well are inexpensive and should water all parks and city, county, and school grounds. This area became a ‘Joke Nationwide’ naming its new project ‘Talking Waters’. Citizen deserve cheaper water for lawns and such. But pumping from a lake full of excess rain is too simple and inexpensive.